Lockheed Martin Corp (NYSE: LMT) is the largest defense, aerospace and advanced technologies company based in the United States employs approximately 105000 people worldwide. The company operates mainly on four business segments i.e Aeronautics, Missiles & Fire control, Rotary & Mission system and Space systems. It’s the world’s largest defense contractor based on revenues in the fiscal year of 2014. So far the stock that has seen a price change of 16.25% so far this year. Currently paying a dividend of $2.2 per share, the company has a dividend yield of 2.89%. In comparison, the Aerospace defense industry’s yield is 0.96%, while the S&P 500’s yield is 1.96%. The company’s current annualized dividend of $8.80 is up 7.3% from last year. In the past five-year period, Lockheed Martin has increased its dividend 5 times on a YOY basis for an average annual increase of 10.57%. Indicating a highly optimistic Future ahead which could attract more investors. 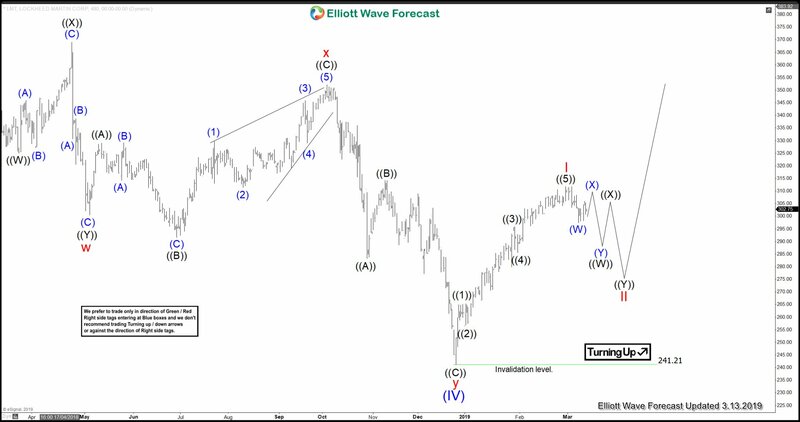 However, in this blog, we will be taking a look at the technical picture of the stock using the Elliott wave theory to identify future price action in the stock below. 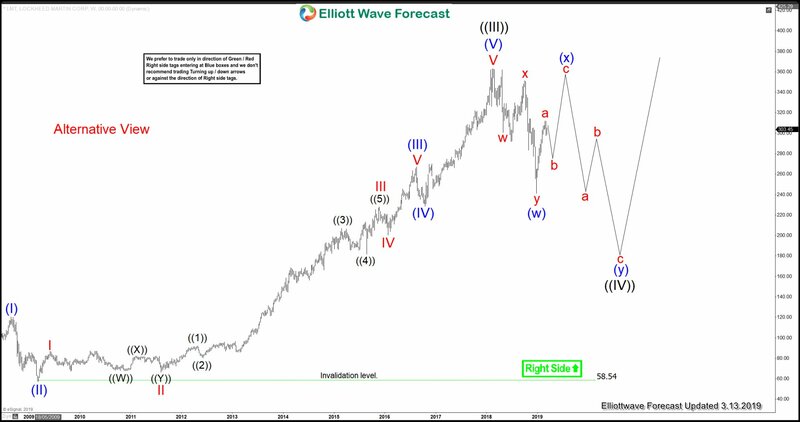 Looking at Weekly chart, the cycle from all-time lows is unfolding in powerful impulse Elliott wave structure in Grand Super Cycle degree. 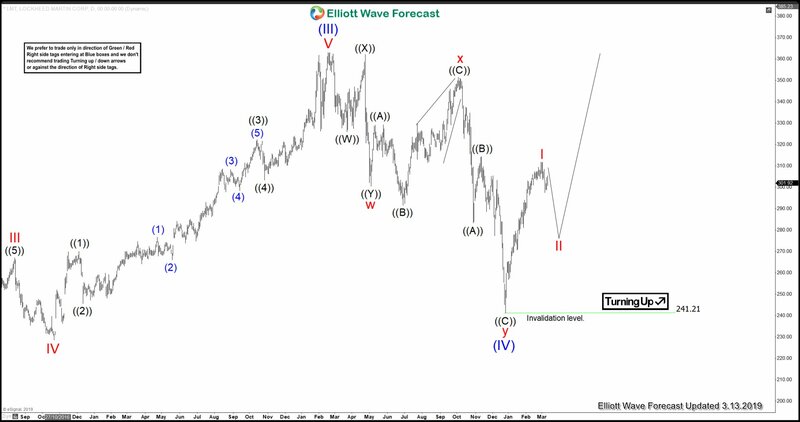 Looking to extend higher towards $391.06-$437.50 in 5 waves structure to end the cycle from Oct 1999 low in wave ((III)). And then from there, the stock is expected to see a bigger 3 wave pullback in Grand Super Cycle degree wave ((IV)) before next round of rally starts. Now looking at Daily Chart, the cycle from 2/16/2018 peak ended the correction against March 2009 low in Super Cycle degree wave (IV) at $241.21 low as double three structure. 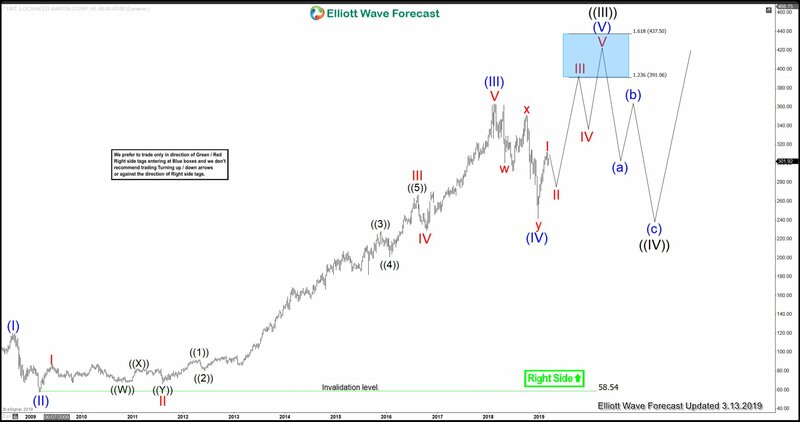 While dips remain above $241.21 low, the stock is expected to resume the upside in Super Cycle degree wave (V) before completion of wave ((III)) can take place. However, a break above 2/16/2018 peak ( $363) still needed to confirm the next move higher towards $391.06-$437.50 area & avoid double correction lower from the peak. In conclusion, the cycle from all-time lows is showing incomplete impulse structure in Grand Super Cycle degree in longer-term view. Suggesting that the bulls should remain in control looking for more upside either against $241.21 low or against $58.54 March 2009 low. While in short-term price action the stock still needs to clear & see a break above 2/16/2018 peak ($363) peak to confirm the next extension higher. Above is the alternative view in Weekly time frame, in which instead of making new highs the stock can fail below 2/16/2018 peak ($363) peak. It may do a double correction lower and end up correcting bigger cycle from November 1999 low in Grand Super Cycle degree wave ((IV)) before resuming higher again.